I have more than 20 years experience in the medical and healthcare industries and I have always loved helping and inspiring people. I initially started my career as a young Nurse back in Sweden. I moved to England in my mid 20's and started my own, very successful business manufacturing and selling Natural and Organic health and beauty products (Herbal Linéa). At its peak I had several shops and market stalls employing full time and seasonal staff. I loved my business and I was working 80+ hours a week loving every minute of it. After the birth of my children I felt I needed more energy to be able to cope with motherhood and full time working life. I wanted to feel more energized and so I started experimenting with making changes to my diet. First I stopped eating dairy, then wheat and sugar. I had been a vegetarian on and off since I was 13 and now I decided to stop eating meat again. I also went to see a Nutritional Therapist/Naturopath for some support and help. I was absolutely blown away by how well my new way of eating made me feel. This resulted in a new direction in my life and a passionate love affair with vegan Raw Food. Not only was I feeling better and more energized but I looked better; my skin was clear and glowing for the first time ever in my life (I have suffered from spots and acne since my teens), my weight was back to my pre-pregnancy weight, my hair was shiny and I looked and felt younger. I was so amazed by the way that my new diet made me feel, both physically and mentally, that I decided to study Nutrition full time so that I could help others to feel as well as I do without the help of stimulants like coffee and sugar or even medication. I was amazed and blown away by all the knowledge there is out there and how little most people (including myself at the time) know. I felt I found the holy grail. I am now devoted to sharing this knowledge of food and lifestyle that is possible for everyone. With a little self dedication and commitment. Whilst studying, I worked on myself using detox, fasts, juices, cleanses and other natural techniques. This helped me make even more amazing discoveries about my health both physically, mentally and emotionally. This has helped me make valuable changes in my life as well as my family’s lives. I know I can be super healthy and still eat like a Queen. In my house there is always something happening in the kitchen. Concoctions of creams and lotions have turned into sprouting, fermenting, dehydrating, mixing and blending. I am totally aware of the hardship of working full time, bring up a family and at the same time trying to look after yourself and be healthy. Whilst I was studying nutrtion I had a lot of time and it was easy to look after myself. When back to fulltime work I had to juggle and prioritise what is important and it is not always easy. When you have to work long days and then do all the house shores and spend time with family and see friends and all other musts it is easy to forget about yourself and what is good for you. Having the knowledge of what is good or bad for you in the first place is obviously important but we also seem to need a bit of reminder now and then to keep us on the right path. We all live crazy busy lifes so now more than at any time before it is important to take that time out now and then. Also doing everything at once rarely work more than short term. To change things long term it is better to take baby steps and do small changes that last long term. I am a very well qualified health care practitioner. 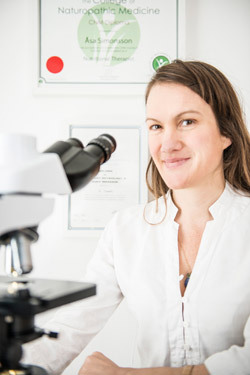 I am qualified and certified as a Nutritional Therapist and a Naturopath since 2010 with the respected London College of Naturopathic Medicine (CNM), following three years of full time study and clinical practice. I am still studying and taking many courses regularly to gain more knowledge. This is something that is expected by all health care practitioners and something I love to do. I am also a Registered Nurse here in the UK as well as having a BSc in Psychology. I am passionate about mental health and have completed my full training in Journey Therapy and Coaching. I am keen to see a variety of clients and welcome everyone. I specialize in Live Blood Analysis which is an amazing tool to use in a nutritional consultation. I also use a bio-resonance electro dermal screening devise that is able to measure electrical impulses in your body enabling me to uncover obstacles standing in the way of health. Contact me for more information. I am not able or even allowed to diagnose anything in a consultation. This would be against any of the professional bodies I am a member of as well as the law. Instead I consider multiple factors including environmental influences, biological and genetic influences as well as mind and emotions. You don’t have to feel ill to benefit from a consultation with me. Live Blood Analysis, Bio-resonance screenings and Nutritional therapy are especially great tools for preventing disease and is an amazing thing to use as a six monthly or yearly checkup to keep you on track with good health and give you that little reminder of the health benefits you will get through healthy eating and healthy lifestyle. I am also a Raw Food Chef and absolutely passionate about Raw Food. 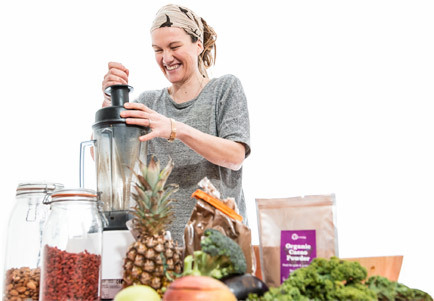 I work as a Raw Food Chef at retreats and is part of Restore Retreat an artisan small retreat for women including high vibrational vegan foods (by me), restorative yoga, nutritional therapy, sound healing and healing treatments. We run these retreats 3 times a year. Contact me for further information. I also do caterings upon request as well as raw food pop ups. I am available as a raw chef or natural vegan chef for any event you might be thinking about. Please contact me for further information. I run various courses and workshops. I teach at the Natural Chef and Natural Vegan Chef program at the College of Naturopathic Medicine in London. You will also find me at my favourite charity 'made in Hackney' running various master classes. I also run regular private workshops either in my home click here for more information on these or you can host one in your own home. Contact me for further details regarding this. One of the most popular workshops I am offering is fermentation and Culturing of vegetables, fruits, drinks and nuts. I have been fermenting in one way or another most of my life so have an extensive knowledge about fermentation. I am currently writing my first book that has just been sent to my publisher for some final amendments. Hoping to be out May 2019.